We leave Chania in a westerly direction for Kissamos, and come first to the seaside village of Agioi Apostoli. A diversion from our route here will take us to Galatas. A famous, small village, as a scene of heroism and self-sacrifice during the Second World War. The area is densely vegetated and has many streams; the beaches of Kalamaki and Glaros are the most popular in the vicinity. The coast roads continues west through pretty villages such as Kato Daratso, Agia Marina, Kato Stalos and Platanias. Next, we come to Maleme, 16.5 km west of Chania. The village was in the front line during the German attack of 1941, since the small airport nearby was among the first targets of the paratroopers. After total of 20 km. we come to Tavronitis. A village called after the river of the same name. The road here leads south to Palaiochora, while if we head straight on for Kastelli we will come to Voukolies (at an altitude of 110 m., on the west bank of Tavronitis) and then Floria (at 850 m., the highest point on the route). After this point the road begins to descend in a southerly direction; after 58 km. we come to Kantanos, the chief town of the sub-prefecture of Selinos, in the midst of the fertile Selinos valley. The name “Kantanos” means “city of victory”, and it comes from the town’s long struggle for liberty. In the surrounding area are numerous of Byzantine chapels with fine wall-paintings. We continue through Plemeniana, Kakodiki, Sarakina and Vlithia and eventually reach Paleochora, on of the towns of the south coast of Crete, facing the Libyan Sea. In Paleochora we should not miss Gavdiotika, the old part of the town, built with narrow alleys by fishermen from Gavdos, beneath a hill on which are the ruins of a Venetian castle. There is an interesting Historical Museum in the town, with important exhibits from the period around the War of Independence. Nearby is the Anydri-Yaniskari gorge, and to the west of the town is the superb beach of Pacheia Ammos. Little boats ply back and forth along the coast each day, linking Paleochora with Sougia, Agia Roumeli and Chora Sfakion, and sailing out three times a week to Gavdos, the most southerly inhabited place in Europe. According to the myths, Gavdos is Calypso’s island of Ogygia, where Odysseus shipwrecked. We continue in a northerly direction, coming first to the village of Moni and then to thew upland settlement of Rodovani – with interesting churches – and next Temenia. If we carry on along this dirt track we will arrive in Sougia, thus avoiding the need to take the boat from Palaiochora. Sougia stands on an attractive sight along a pretty beach of small pebbles and is popular tourist resort. The modern church of the village contains a fine mosaic which originated in a sixth-century basilica. 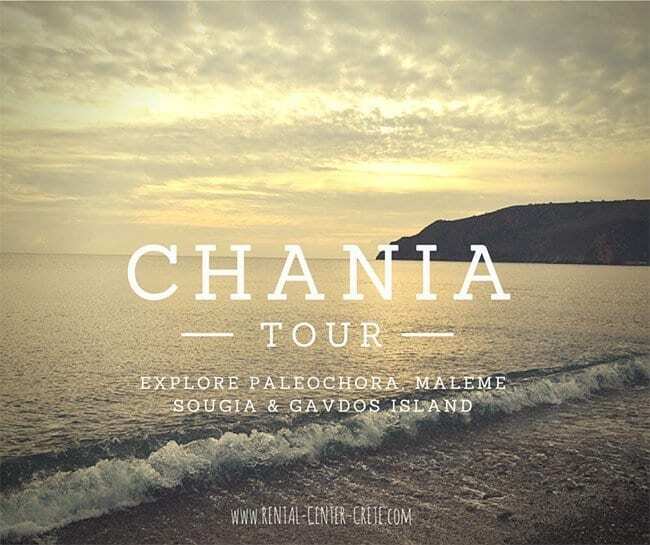 We return to Rodovani and head back to Chania along a different route which takes us through Maralia, Kampanos, the beautiful village Epanochori with views to the White Mountains and Libyan Sea, and Agia Eirini, a tiny hamlet on the banks of a seasonal river. Beyond Agia Eirini is a passable road through the White Mountains to Omalos. If we take this route we will go through the mountain villages of Prassies, Nea Roumata and Skines before reaching Alikianos. There, among orchards, are the ruins of the magnificent Da Molin tower, and there is also a Byzantine church of St George, built in 1243 and with fifteenth-century wall-paintings. We travel on through Ayia, where there was an open prison for Greek patriots during the German occupation, and thence back to Chania. Samaria Gorge: What you must know before visiting!